Sunday marked the 98th running of the Indianapolis 500, an event billed as the “greatest spectacle in racing.” One can only truly experience the magnificence of this historical event if lucky enough to be present at Indianapolis Motor Speedway (IMS) during Memorial Day weekend. 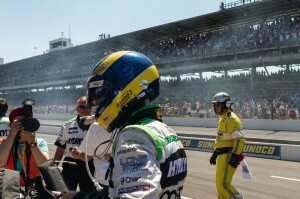 KVSH Racing’s Sebastien Bourdais at the 2014 Indy 500. Close to 300,000 people attend the annual race, which originally began in 1911 on a track of 3.2 million bricks. A yard-wide strip of these bricks still remain across the width of the asphalt track. It has become customary for the winning driver to kiss the “yard of bricks” after the race. Ryan Hunter-Reay got to kiss those bricks as he became the 2014 Indy 500 champion, winning in dramatic fashion, holding off three-time Indy 500 winner Helio Castroneves by .0600 of a second, one of the closest margins of victory in IndyCar history. As exciting as the race was, IndyCar Series, the premier level of American open wheel racing, is struggling to capture viewers. The Series saw its viewership drop 22 percent last year for 19 race telecasts across ABC and NBCSN, compared to 15 telecasts in the prior season, averaging 953,000 viewers, down from 1.2 million viewers in 2012. Much of the downturn has been a result of the infighting between IndyCar Series and Champ Car World Series (formerly CART). The two finally merged in 2008, but left a trail of discontented fans fueled by top drivers leaving the series for Formula One and NASCAR. There is some good news. Ratings are up, a little. This year’s Indy 500 scored a TV rating of 4.0, compared to a 3.7 score in 2013. The added races in 2013 also led to increased total reach for the race series. Still, attracting eyeballs continues to be a challenge for IndyCar Series organizers, not to mention getting fans in the seats. While attendance at the Indy 500 remains a contested debate among race fans, industry insiders are positive about IndyCar’s future, saying the series is “rising,” and that they are confident it will make its way back to the glory days of the 70s, 80s and 90s. This may be a recipe for success, although it’s unclear if Hunter-Reay was solely responsible for the higher ratings. Media reports say race fans were watching NASCAR driver Kurt Busch compete in both the Indy 500 and Coca-Cola 600, attempting to drive 1,100 miles in a single day in two different states. Busch finished sixth in the Indy 500 and withdrew from the Coca-Cola 600 due to a blown engine. It’s really about the drama that gets people interested. Look what Tiger Woods did for golf. Without him in the field, golf tournaments just don’t have the same cache when he plays. Good, bad or indifferent, more people are watching Tiger. INDYCAR also can learn a thing or two from NASCAR’s playbook, such as extending the race season and adding more drivers. A side-by-side comparison between INDYCAR and NASCAR show stark differences, everything from more prize money to more races and drivers. While adding U.S. drivers to the IndyCar Series may help spur fan interest, it’s hard to deny the talented array of race pros that hail from other countries, including four-time Series Champion Sebastien Bourdais of KVSH Racing. Contrary to some public opinion, INDYCAR is as American as apple pie. A tour of the Indiana, IL-based IMS Hall of Fame Museum is evidence of the speedway’s impact on racing history, right here in the United States, a theme that may help carry the IndyCar Series back to national prominence. In the interim, it may not be a bad idea to raise the drama level between drivers – because everyone loves a great race story.